Hey everyone! I am still alive and well...we just came back from a WONDERFUL getaway in Chicago and had a great time. I am now getting back to a "normal" schedule and am starting off my reviews this week with an awesome company!!! I was recently contacted by The North Carolina Barbecue Company regarding doing a review AND giveaway of one of their mail order barbecues and I was totally thrilled! I am a big barbecue fan and here in NY during the summer, you will find just about everyone enjoying a barbecue of some sort. I am also a fan of pulled pork and love all the flavors that are included in that. Before I get into my review, I would first like to tell you a little about this unique and one of a kind company. "The North Carolina Barbecue Company was founded to deliver to doorsteps across the country the unique culinary culture of our great state. Our goal is to provide a true representation of the two distinct styles of North Carolina barbecue; the Piedmont (western style) and the Eastern style. There is a civil disagreement among barbecue purists in our state that has been percolating for well over a century, with no sign of resolve.Our aim is to not pick a side in this epicurean battle, but merely present the argument. Not only have we produced an authentic Eastern and Piedmont BBQ, sauce, and slaw combination, we have found the best way to deliver it anywhere in the USA. Now when you need a real barbecue fix, it is only a click or a call away. No matter where you are." Rick Scott, a native of High Point, NC (graduate of East Carolina University) was raised on the piedmont style and exposed to the eastern style while in school down east. After graduating, he travelled extensively throughout the state and beyond, realizing the differences in BBQ among his home state; as well as where it stood among other styles of BBQ across the country. The more he travelled, the more he realized the unique divide in North Carolina. He also became more aware of the fact that North Carolina truly is the “Cradle of ‘Cue.” As a founding member of The North Carolina Barbecue Company, Rick wants to establish the company as a true ambassador for the state as a whole, and as an actual home page for the state and it’s unique style of BBQ. Ryan Pitz, a native of Orange, VA (graduate of Hampden-Sydney College) had some exposure to pulled pork BBQ growing up, but became a true NC BBQ convert after having lived in Greensboro, NC for nearly a decade. His passion for great BBQ peaked when he wanted to share authentic NC BBQ with friends, family and clients across the country. Unfortunately, there wasn’t a good mail order solution – one that truly represented the two distinct styles of NC BBQ. No matter how much he “talked up” the unique NC BBQ experience to folks in other states – it simply never translated unless they were able to come to NC and experience true pork BBQ first hand. Together Rick and Ryan collaborated to found The North Carolina Barbecue Company and finally bring true NC BBQ to the rest of America with their unique flag ship product known as The Battle Box™. 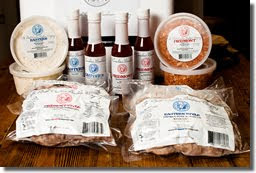 The North Carolina Barbecue Company provides several different products...each very different in origin, flavor and style. The first is the Piedmont Barbecue. This barbecue comes from the western side of North Carolina...particularly Lexington, Shelby, Greensboro and Winston-Salem. The pork is cooked over Hickory coals and is usually served chopped or sliced. The second is the Eastern Barbecue. This one features whole hog pork meat cooked over Hickory or Oak coals, then pulled mixed and chopped together. The different flavors that are provided from the different parts of the pig make it a very delectable barbecue. Along with the lucious pork, each of these barbecues comes with it's own unique barbecue sauce and Slaw (or coleslaw...as I...a true northerner calls it!). The Piedmont sauce (called "dip") is slightly spicy in flavor with primarily a vinegar base, salt, pepper and ketchup. The slaw is also red, vinegary and can be peppery. With the Eastern sauce you have the vinegar base, pepper and salt. The only difference is that there is no ketchup in this sauce. The slaw is more traditional, sweet in flavor and can range between white, yellow or green in color due to added mustard or outside cabbage leaves. What really struck me about this box was the fact that there was one of each barbecue to try. Hence...the "Battle Box" title. Can't figure out which flavor you will like the best? Get the Battle Box and let the two flavors duke it out! These barbecues come in a nice large styrofoam box to keep them cool...inside is dry ice that keeps the barbecue fresh and also keeps it from spoiling. Upon opening the box, everything is neatly assembled with the meat on the bottom. I decided to make this for dinner the other night and my hubby and I were both terribly excited! Preparation is a cinch as the BBQ is already cooked and just needs to be reheated. You can do this either by placing the unopened pouches into a large pot filled with water and heat just until boiling (removing the pouches before boiling occurs), or remove the meat from the pouch and heat on the stove in a skillet. You can also heat in the oven as well...just remember to remove the meat from the pouches first. I chose to heat the meat on the stove. It smelled SO good! My husband walked in from work and it really smelled like I had been cooking all day...LOL! Because my box contained one of each barbecue, I ended up having a favorite. My favorite was the Eastern Barbecue. I think this was because I am not a huge fan of spicy foods so this was the milder of the two. My husband preferred the Piedmont as it was spicier. The pork was wonderful! Honestly, I didn't care for either of the sauces as they were too vinegary and a little to much zing for me...I am not a huge fan of vinegar so these didn't suit my taste very well. But for someone who loves vinegar this would be PERFECT. The same went for the Piedmont slaw...just a little too much vinegar for my taste. But, the Eastern Cole Slaw was very good. What is really nice about the Battle Box barbecue is that the meat can be frozen for 6 months and because there are two pounds of meat, that is alot for two adults. So, you can use one pouch and put the other one in the freezer for another meal later down the road. That is really great! If you are having a larger get together and need more BBQ, no problem! The North Carolina Barbecue Company offers small, medium and large boxes to suit your "crowd size". So, in my opinion...The North Carolina Barbecue Company really gives you an authentic BBQ experience~the North Carolina way! The gift potential is amazing and you will definitely "wow" that person on your list who lives too far away for you to see this Christmas season. Mandatory Entry:Visit The North Carolina Barbecue Company and tell me which of the barbecues you would LOVE to try. You do not have to be a blogger to enter, but you must leave a valid email where you can be reached should you win. If you do not leave an email address, it must be where I can easily find it. This giveaway is open to US residents and will end 12/13 at 11:59 pm EST. The winner will be chosen using random.org and will be notified by email. The winner will have 48 hours to respond, or another winner will be selected. Disclaimer: I received no monetary compensation for this post. I did receive a Battle Box Barbecue for review purposes All quotes are from The North Carolina Barbecue Company website and email. All thoughts and opinions are mine. I want to try the Piedmont style, since it doesn't have any sauce added and is a bit spicier. I would like to try the Battle Box because being from the South we have good Eastern BBQ but I've never heard of Piedmont so I'd like to see how they compare to each other. Hello, I am Glenda and I am from Mommies Point of View. Thanks for following me and I am doing the same for you. I will be back to enter the Giveaway as a Texan we Love Bar B Que. I got the Battle Box too and it is an amazing gift. I live in NC and have always loved the Eastern Style, but I actually ended up liking the Piedmont better! Who knew. It was fun battling it out with family on which 'cue won. I would love to try the BBQ Dipping sauce! I would like to try the Battle Box because I have no idea which would be better, after I taste it I'll let you know! We would like to try the Piedmont. I would love to try to Eastern Style! I would love to try the Piedmont style. I'm following North Carolina Barbecue on twitter as @bmom76. I want the North Carolina Piedmont "Lexington" Style BBQ. I'd love to try the piedmont style bbq! I would love to try the Piedmont style bbq. 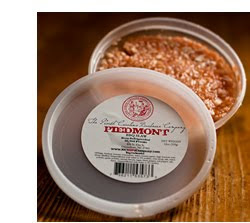 I would love to try the Piedmont style as it sounds close to what we make at home. Thanks for the chance to win! My mouth is seriously watering. Looks delicious. I would love to try it all, especially the pulled pork-YUM! I like them on Facebook under Lisa Berkery. I would like to try The NC BBQ Battle Box™. I'd like to try the eastern style bbq sauce! I would like to try the Piedmont Style. I would like to try the Battle Box because Im not sure which type I would prefer! Hi. I would love to try the Piedmont style I live close to Eastern NC and have tried theirs...so love to try the western style. My mouth is watering just thinking about it. I follow the NC BBQ Company on FB. I signed up as a follower! I grew up on this stuff - there's nothing like it anywhere else but NC. I love both Piedmont and Eastern, so the Battle Box would be a wonderful prize to win. I live in Florida now so it's great to know there's a place to order up the good stuff! I love vinegar flavors and the Eastern BBQ sounds so delicious to me! I like NC BBQ Company on Facebook user Lisa Garner. I'd love to try the Medium Battle Box! Thank you for the giveaway! I'm following NC BBQ Company on Twitter @lisalmg. I would like the Battle Box because I like the Eastern style and my husband perfers the other. I'd love to try the Piedmont Style, I think. They both sound tasty.